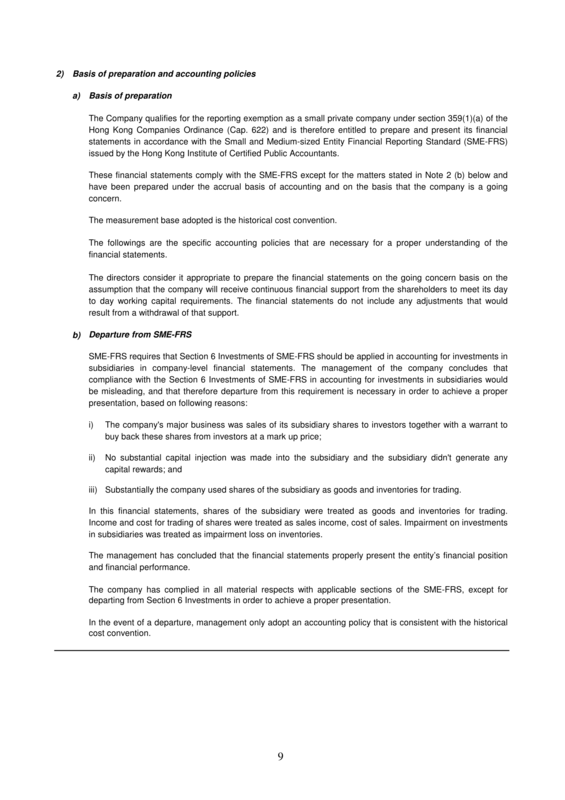 As set out in Note 2(b) to the financial statements, the financial statements has departure with Section 6 Investment of the SME-FRS. In this financial statements, shares of subsidiary are treated as goods and inventories for trading. Income and cost for trading of shares are treated as sales income, cost of sales. Impairment on investments in subsidiaries is treated as impairment loss on inventories. We were unable to satisfy ourselves as to whether such departure is necessary in order to achieve a proper presentation and whether the financial statements has properly presented the financial position and financial performance of the company. Any adjustments that might have found to be necessary in respect of the above would have had a consequential effect on the net liabilities of the company as at DD MMMM YYYY, and of its [profit/loss] for the [year/period], and the related disclosures made in the financial statements. (c) the nature and financial effect (when quantifiable) of the departure, including the treatment that the SME-FRS would require, the reason why that treatment would be misleading in the circumstances and the treatment adopted. In the event of a departure, management should only adopt an accounting policy that is consistent with the historical cost convention.